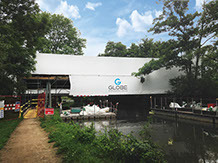 Globe Scaffolding has been a reputable, structured and successful scaffolding business since 1970. With a strong work ethic and a focus on customer service, we maintain safety, professionalism and client satisfaction to a very high standard. We currently have an annual turnover of around £6m and cover all areas of London as well as East Anglia and the Entire South East of England. Our Main HQ is in Croydon and we have recently added a Chelmsford Branch to enable us to provide a better service and cover a wider geographic area. We offer a trusted, reliable and professional service and offer cost-effective solutions on all projects we undertake. We also develop and nurture strong working relationships with our clients and this is reflected in the high percentage of repeat customers we retain. Health and Safety comes first at Globe Scaffolding and we have a dedicated Health and Safety Director who ensures that all operatives comply with our high expectations. This is further supported by our Operational Management Team who visit most sites every day, setting us apart from many other scaffolding firms and giving clients that extra peace of mind. We provide project specific Risk Assessments and Method Statements for each task and all operatives are progressively trained in line with CISRS recommendations. Our Lead Scaffolders have completed SSSTS training and many have Emergency First Aid at work certificates. At Globe Scaffolding we offer a full service from the initial concept stage right through to the successful completion of your project. Scaffold solutions are what we know and we provide expert support for all of our clients. Directly employing around 80 Scaffolding operatives you can be assured we will work alongside you to provide the level of service you require. With 45 years in the trade, we are familiar with the ever changing environments in construction and try to always adapt and accommodate to meet programme requirements and overcome any unexpected site constraints.